Heggy's Candy Company is proud to offer our New Gift Specials. Whether you're looking for a Wedding Gift, Christmas Gift, Anniversary Present, or just a gift for someone special, Heggy's has your answer. 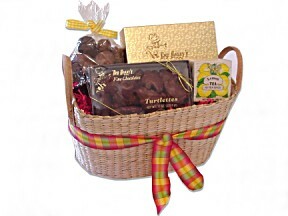 These gifts are direct from the factory at wholesale prices and handmade for that personal touch. Many of the Gift Baskets are packed with a variety of candles, jams and jellies, stuffed animals and of course, Heggy's handmade treats. You can also request a greeting card to match the occasion. Your Heggy's Gift Specials Today! You can have Heggy's Gifts delivered right to your door anytime. Our Gifts are shipped fresh direct from the factory all year long. Please click on the photo link to the left for more details.